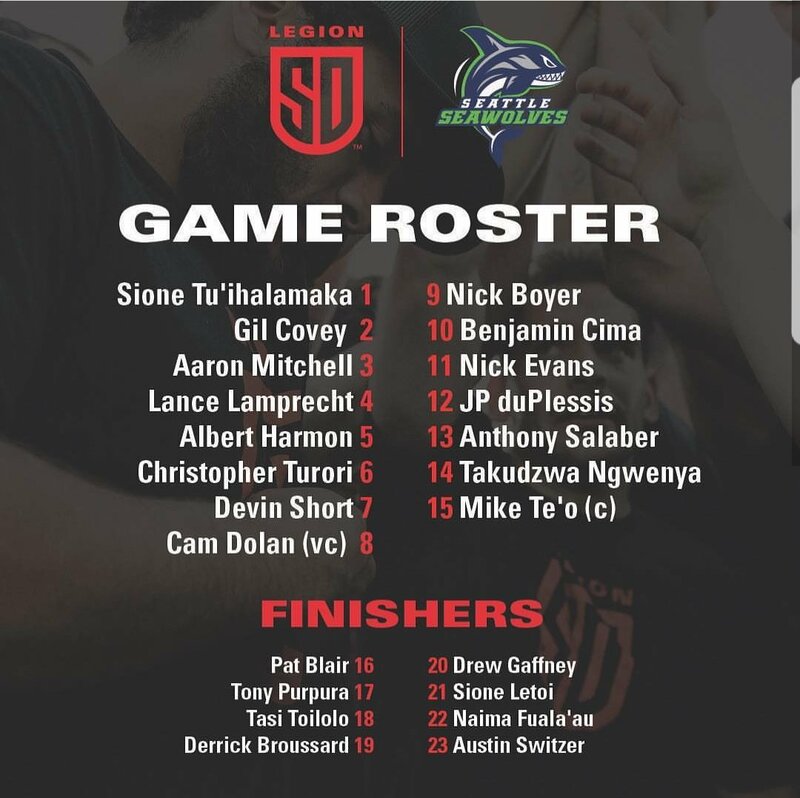 The Seattle Seawolves hosted the San Diego Legion for their first match of the 2018 Major League Rugby season. This turned into a game of the scrums versus the scrum nots. Seattle had their way in the scrum and San Diego had no answer. Ben Cima got the scoring started for the Legion in the 5th minute with a penalty kick about 45 meters out. One of the questions coming into this match was San Diego's scrum. We got out first look near the ninth minute of the game. Seattle showed we were right to question the Legion's scrum. It was the Legion put in, but Seattle just pushed them straight back and were able to earn the scrum penalty. Brock Staller was able to tie the game with a penalty kick. After earning that scrum penalty, the Legion were called for not back 10 meters. Staller was able to slot the ball through the posts. Ben Cima had a chance to take the lead back, but his second penalty kick just missed. The Legion had a fantastic piece of play, but gained nothing from. They had 20+ phases, they worked themselves back and forth across the field before they were able to earn the penalty. They went for territory but lost possession in the lineout. Brock Staller got the Seawolves first try. The Seawolves had a scrum, Phil Mack passed out of the scrum to Will Holder, who offloaded to Staller for the try. Staller ran a nice line right through the Legion's defense. Staller attempted to add to the Seattle lead with a 40+ meter penalty kick, but hooked it left. Ben Cima was able to bring the Legion to within four with another 40+ meter penalty kick. The Legion earned that penalty after the Seawolves were called for boring in from the side. Staller extended the Seawolves lead back to seven just a few minutes later with another penalty kick. This one just a few meters inside of 40. The Seawolves next try came by the way of penalty try. The Seattle scrum forced three straight scrum penalties from the Legion, forcing the referee to award a penalty try for Seattle. A new law implemented this year means the conversion is automatically awarded. Sione Tu'ihalamaka was eventually handed a yellow card. Officially called for collapsing the scrum, but had been warned by the referee repeatedly beforehand. Ben Cima added another three points on the board for the Legion to the start the second half. Seattle was called for not releasing and Cima slotted the kick through the posts. The Seawolves continued to put tremendous pressure on the Legion scrum. The Legion eventually conceded another penalty try. The Legion were able to get a try on the board. After a quick tap penalty that Mike Te'o kicked deep, the Legion were able to turn it over and earn a penalty. They kicked to touch for the lineout where the Legion used their maul to earn their try with Chris Turori being given credit. Seattle's forward pack once again provided a penalty try. A five meter scrum for Seattle and another penalty try. Drew Gaffney got that try back for the Legion. Another lineout for the Legion, but Dolan got stopped short after a quick tap penalty. Gaffney was able to clean up for the try that was awarded after some confusion by the referee caused by the lines on the field. Cam Polson answered right back for the Seawolves. After turning the ball over on the restart, Seattle went one way, then came back the other way across the field before Eric Duechle offloaded to Cam Polson for the try. San Diego had one last chance for a score, but Dion Crowder forced a turnover and Phil Mack kicked to touch to end the game. This was an impressive performance by the Seattle scrum. It may well be the best one in Major League Rugby. 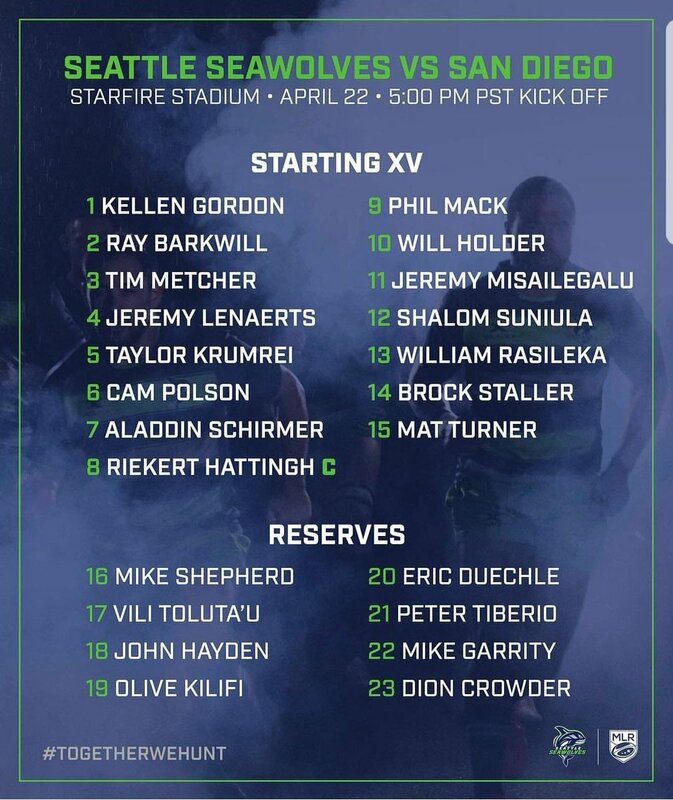 One could say that Seattle has the most complete team from 1 to 15 in MLR. San Diego has to work on their scrum, otherwise Penalty Try will end up with the most tries this season. San Diego did have its moments, but those came few and far between. They will need to shore it up. San Diego are back home next Sunday as they host the Utah Warriors. While Seattle host the Glendale Raptors in the CBS Sports game of the week next Saturday.